Would you love to just step in the shower and wash your fatigue away or start your day in a rain shower? Do you love optimum water coverage that gives you a relaxing bath? If your answer to these questions is yes, what you need is the best rain shower head. This is a unit that mimics the rain and will provide a full body coverage which is soothing and relaxing. With a rain shower head, you do not have to keep moving to get water on some parts of your body, your body will be in the water coverage and this makes things fast and easy. If you want to buy a rain shower head, you can check online for a high quality shower head or visit your local hardware. The most important thing is to know that the unit you are purchasing is genuine and of a good quality. A shower head is not a product that you should be buying often and this means that you should make an informed decision when buying one of these units. To help you in your shopping, this article contains some of the top best rated rain shower heads in the market and you can use it as a guide to choose the best product for your bathroom. How To Choose The Best Rain Shower Head? The Moen S6320 Velocity 8 inch two-function rain shower head is a mid-priced unit with impressive functions and a great design. The construction of this rain shower head is a mix of metal and brass with a chrome finish that brings in the shiny attractive look. Designers chose to create this shower head using a basic style which will match well with any bathroom regardless of whether it is a modern or a conventional design. This unit comes with a 2.5 gallons per minute flow rate which ensures that though you are getting a rain like experience you are saving a great deal of water. 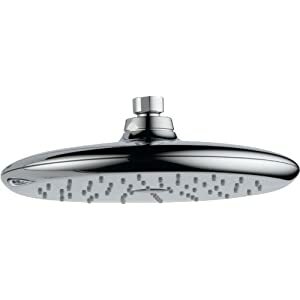 The rain shower head comes in an 8 inch generous size that promises and delivers exceptional water coverage. This rain shower head has been fitted with self pressurizing technology which will channel the water through the unit in a strong spray for a fast and through rinse. You get two functions, one for the rain shower and the other for a concentrated rinse for when you are using hair products or when you need a fast rinse. This unit is also available in rubbed bronze, brushed nickel and antique bronze finishes. 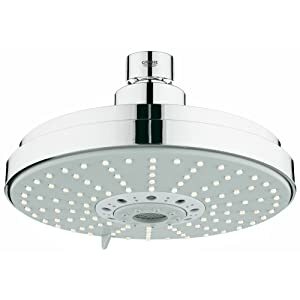 If you need a unit that delivers high performance and is constructed to match with any bathroom design, then you might want to add the Moen S6320 Velocity 8 inch two-function rain shower head in your shopping list. 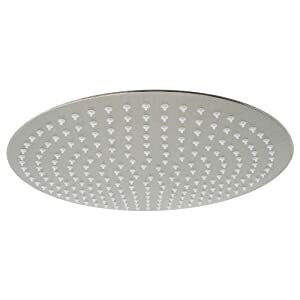 The ALFI brand RAIN16R 16-inch solid round ultra thin rain shower head is a mid-priced unit with an ultra thin design and high performance features. 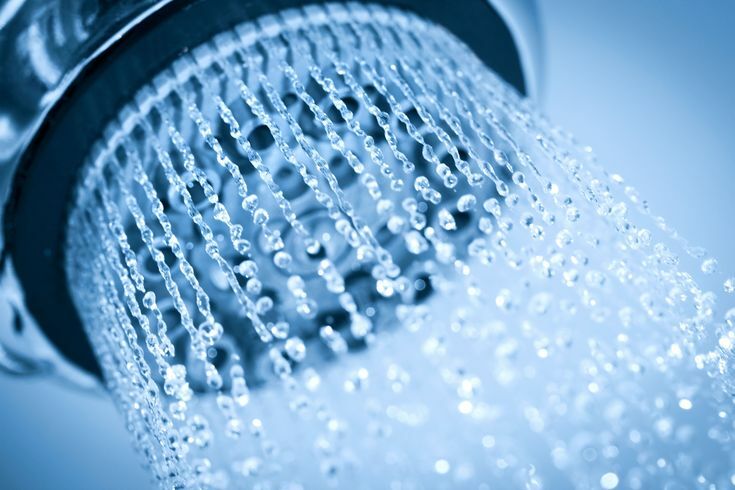 The showerhead is about 2 mm thick, something most people will not believe until they see. The entire shower head body is constructed using stainless steel and given a brushed stainless steel finish which appears like brushed nickel only that it is fingerprint marks resistant. This unit comes in a rounded shape with a generous 16-inch diameter which will deliver optimized water coverage better than most of the products in the market. You get to adjust the shower angle when taking a shower courtesy of the swivel adapter. The unit is fitted with clear rubber nozzles which are easy to clean to prevent any clogging by mineral buildups. You also get 5 replacement rubber nozzles just in case some get lost. The contemporary style will match well with just about any bathroom and the mounting can be on the ceiling or on the wall. With an easy installation, you can get the rain shower head working in just a few minutes. 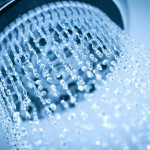 The rain shower has a flow rate of 2.2 gallons per minute with will save more water than most products in this category. If you are looking for a high performance elegantly designed rain shower head, then the ALFI brand RAIN16R 16-inch solid round ultra thin rain shower head is a product you should include in your shopping list. 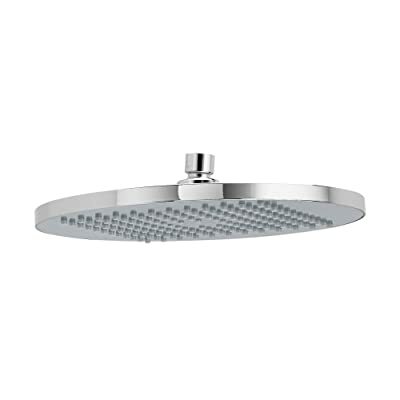 The KOHLER K-13688-CP 8-inch contemporary round rain showerhead is a mid-priced unit with a low profile design and an attractive modern style. This unit has a polished chrome finish which just adds to the contemporary look. The unit has a MasterClean spray face with translucent nozzles that resist mineral buildup and thus ensure that clogging is avoided. In the unit, there is Katalyst spray technology and an induction ball joint which ensure that there is always a strong spray. The low profile design makes this unit an important centerpiece in any bathroom. With a water flow rate of 25 gallons per minute this unit will provide a luxurious drenching rain like effect and also save a great deal of water. The optimized spray face design creates a uniform and denser spray pattern that gives you a great shower time. You can easily install this unit because it does not require any specialized tools. In just a mater of a few minutes you can have the unit ready for your first rain shower. If you want to change your current shower head and are interested in a rain like feeling, then the KOHLER K-13688-CP 8-inch contemporary round rain showerhead is a unit you should be thinking about. 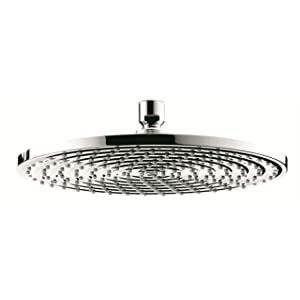 The Hansgrohe 27474001 Raindance downpour air showerhead is a high price high performance an elegantly designed rain shower head. This unit comes with a brass construction which is covered by a chrome finish to give it a shiny contemporary look. The 10 inch shower head promises and delivers optimum water coverage. This rain shower head will give you a rain like effect which will make you feel as if you are in the rain but still save a great deal of water with its 2.5 gallons per minute water flow rate. This unit has a QuickClean function which helps you in cleaning the unit. To remove dirt and any mineral build up, you simply rub the nozzles and they will be clean as new. This will always guarantee you a perfect shower spray. If you are interested in changing the shower experience in your bathroom, you need the best rain shower head. If you are shopping for a new unit for your bathroom, then the Hansgrohe 27474001 Raindance downpour air rain showerhead is a product you should check out. 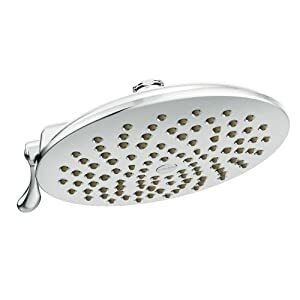 The Delta RP52382 touch clean raincan single-setting showerhead is a low-priced high quality shower head with impressive functions and a smooth elegant design. This is a single setting full spray rain shower head that features a touch clean spray face. Designers gave this unit fluid lines and a clean contemporary look that will blend in perfectly in any bathroom design be it modern or old school. With this unit you get a luxurious body spray and a rain like feeling since the shower head and the spray will work in perfect harmony making your bathroom your sanctuary. This rain shower head is constructed using brass and then given a chrome finish which makes the basic style appear more sophisticated. This piece will stand out in any bathroom and its 2.5 gallons per minute water flow rate will ensure that though you are experiencing a strong powerful spray, you are saving a lot of water. Installation is a wall mount and this is an easy process that does not take you more than a couple of minutes to have the shower head ready for your first rain shower. If you need a basic shower head design that is reliable and durable, think of the Delta RP52382 touch clean raincan single-setting showerhead when you are out shopping. 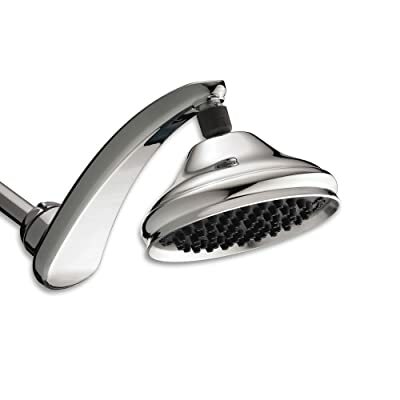 The Waterpik RPB-173 drenching rain fall showerhead is a low priced high performance and high quality shower head. This unit is constructed using ABS and is given a chrome finish which gives it the shiny contemporary look. The shower head comes with a removable flow regulator and an advanced OptiFlow technology that ensures you get the best shower experience every time you step into the bathroom. This unit comes with a designer arm which allows you to position the water at an angle or overhead depending on your preferences. Designers of this unit ensured that you will get a drenching rain shower experience with full body water coverage. The shower head is 6 inches to ensure that you are getting optimum coverage. You can now upgrade your bathroom by changing from a normal shower head to the best rain shower head in the market. When shopping for a reliable and high performance rain shower head include the Waterpik RPB-173 drenching rain fall showerhead in your shopping list. This will change the appearance of your bathroom and improve your shower experience. The American Standard 1660.680.002 8-inch rain easy clean showerhead is amid-priced unit with an elegant contemporary design and high performance. This unit is constructed using metal and this is well covered using a polished chrome finish which gives the unit a shiny attractive appearance. The unit is designed for a ceiling mounting where it delivers a soothing rain shower. You do not have to worry about water wastage since this unit has received certification from WaterSense based on its 2.2 gallons per minute water flow rate. The design will fit perfectly in your bathroom regardless of whether it is a conventional or contemporary design. The spray face is easy to clean and the flange and arm are not included and will have to be purchased separately. With an 8 inch rain shower head, this unit will ensure that you are getting optimum water coverage. If you are shopping for the best rain shower head that will offer durability, reliability and a great shower experience, consider purchasing the American Standard 1660.680.002 8-inch rain easy clean showerhead. The Grohe 28 373 000 Rainshower shower head is a high-priced high performance and elegantly designed shower head with amazing features. To start with, this unit comes with 120 spray nozzles which will give you that rain like experience and make you look forward to taking a shower every day. The shower head spray face has a diameter of 8 inches which ensures optimum water coverage. To complete the rain shower experience this unit is mounted on the ceiling for an overhead spray. You will experience a strong powerful rain spray and still save water since the unit has a water flow rate of 2.5 gallons per minute. This unit is constructed using metal and is given a StarLight chrome finish which brings about the shiny elegant appearance. The designers used a contemporary style that will match well with most bathroom fixtures and change the appearance of your bathroom. If you are interested in the best rain shower head, then you have to ensure that the unit you choose is a high performance unit, a durable piece and a great elegant design. The Grohe 28 373 000 Rainshower shower head can offer all these and thus you should consider it when shopping. 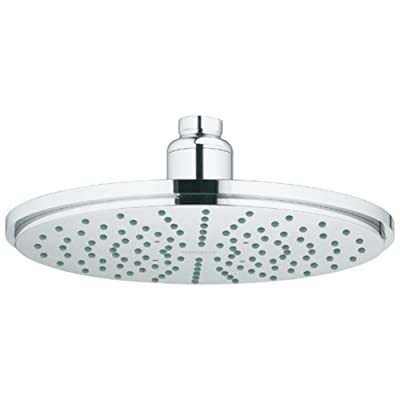 The American Standard 1660.683.002 10-inch modern rain easy clean showerhead is a mid-priced rain shower head with a smooth design and amazing features. This is a ceiling mounted unit with a polished chrome finish that will match with all types of bathroom designs. The unit has water saving flow rate of 2.5 gallons per minute and thus you can enjoy your rain like experience in your bathroom without having to worry about increased utility bills. With a 10 inch spray face that is easy to clean, this unit will always provide optimum water coverage for a relaxing shower experience. Though you do not get the flange and the arm with the purchase you can always purchase these pieces separately. The installation of this unit is an easy process that will take you a few minutes. Transforming your bathroom experience is as easy as purchasing the best rain shower head in the market. 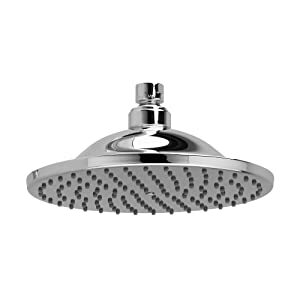 If you are in the process of remodeling your bathroom or you simply need a different shower head that is reliable and durable, consider purchasing the American Standard 1660.683.002 10-inch modern rain easy clean showerhead. The Grohe 27 135 000 Rainshower shower head is a mid-priced shower head with a great finish and impressive features. If you are looking for a durable shower head, then you will love the StarLight chrome finish on this product. The unit is constructed using ABS and then covered with StarLight chrome which gives it a shiny transitional look. This shower head will provide a rain like experience in your bathroom and this is facilitated by the fact that it is mounted in the ceiling. You however do not have to worry about utility bills because this unit will save water through its 2.5 gallons per minute water flow rate. The manufacture fitted the Grohe DreamSpray technology which ensures that you are always getting a strong spray with optimum coverage aided by the 6¼ inch face diameter. This unit also comes with a SpeedClean anti-lime system which ensures that there is no clogging and that you will be getting a consistent spray always. If you are looking for an elegantly designed unit that will change your shower experience and your bathroom’s appearance, then you need the best rain shower head and the Grohe 27 135 000 Rainshower shower head is a great product to include in your shopping list. When you are shopping for a rain shower head, you need to know that there are multiple products in the market and this might confuse you. The best way to approach this process is through identifying the most important features in the shower head and knowing what you want. 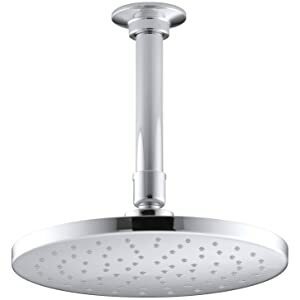 Some of the important things that you need to pay attention to when looking for the perfect rain shower head for your bathroom are the materials used in the construction, the water flow rate, the installation method, is it normal or handheld, the size of the shower head and the functionalities. Since most of the best products will have the best of the features mentioned above, you can zero in on a few products through looking at the style used in designing the shower head, and the price tag. Different manufactures will have different units at varying price tags and this should be your last element in selecting the best rain shower head. Rain shower heads are great additions to the bathroom and will definitely change your shower experience. You only need to know your needs and preferences and match them with the best rain shower head in the market.